Jérôme Stéfanski and family take a weekend break in an exceptional place. It takes a little over an hour to reach Geneva by plane from Brussels. 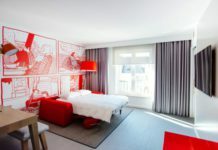 Flights are frequent and at well-appointed times with Brussels Airlines or EasyJet. 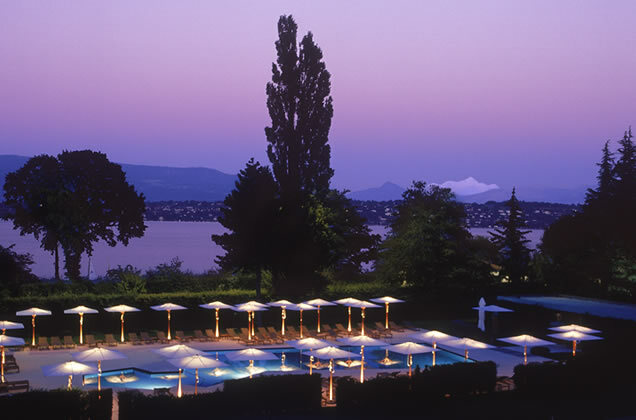 I have often heard people talk about an exceptional location bordering the banks of Lake Geneva: La Réserve Genève. Decision made! I will visit the Swiss capital with my family for the weekend. Geneva is the perfect destination for those who love shopping, nature and relaxation. Luckily, I love all that (and so does my wife)! I take possession of our room key at the reception, and I was amazed by the beauty of the place. Designed as a ‘lodge’, La Réserve Genève boasts a warm, refined decor. Leopard motifs sit alongside African masks. The light is suffused, and the staff are very friendly. A divine smell of musk wafts through the lobby. I close my eyes for a moment and am transported to the heart of the savannah. Elegance and relaxation symbolize this Michel Reybier establishment. A sense of calm washes over the traveler on arrival. I booked a family suite with lake views. The room is so large that it looks like a small apartment. Yet it is very cozy. A nice little crib was carefully installed for my six-month-old son. My wife was ecstatic. She immediately put on her bathrobe and went to relax at the spa where a seaweed massage awaited. Meanwhile, I crossed the garden with my son and walked alongside the large outdoor pool to reach the private harbour next to the hotel. A boat was waiting for us there. It look reminded me of the mythical Riva which cross the Grand Canal in Venice. We sailed for ten minutes on Lake Geneva and reached the centre of Geneva. What service! I had also heard of an incredible tailor whose reputation and service go beyond borders. I went there so they could make me a custom winter jacket in a cashmere fabric. Olivier and Eric, the two friends who have opened the Scabal shop are as friendly as they are competent. A real treat for people who love beautiful cuts and beautiful fabrics. (Scabal, Quai des Bergues 11 – 1201 Genève). I took a short break to enjoy a coffee on one of the nicest terraces of the city, at Café Veranda (Café Veranda, 9 rue du Vieux College – 1204 Genève). The streets downtown are packed with luxury shops – I did well to leave the Missus at the hotel! Before returning to the boat, I did think about her and stopped at Hermès, opting for a chic and timeless silk scarf (Hermes, 39 rue du Rhône, 1204 Geneva). When I gave it to her, she was over the moon. She told me she had a wonderful time with the spa staff. It was eight o’clock already, and we were eating at the hotel. We went down to Le Loti restaurant, where we discovered refined dishes prepared with seasonal ingredients, served in a large room in a real tent – it reminded me of an African camp. The wine list is very enticing, and prices are reasonable for a hotel of this standard. The atmosphere is relaxed and muted. Families and romantic couples around us also appeared to be enjoying a lovely evening. A little tip: the fresh fries are to die for, as is the Lobster Risotto with Saffron. And we would certainly go for the Sea-bass in Salt Crust again. For dessert, we allowed ourselves to be tempted by the house specialty: the freshly-made apple pie, accompanied by a scoop of vanilla ice cream. A real treat! The waiters were gracious with us and our baby. We really appreciated their kindness. We headed to the bar and ordered a nightcap. The bartender served up delicious cocktails. It was Saturday and the DJ lounge played ‘lounge’ sounds that created a very pleasant atmosphere. Before going to bed, I chose my ideal pillow in the ‘pillow menu’ and checked the weather on my smartphone. It’s nice here at the beginning of October. The air is cool, but the sun shines in a blue sky. The following day would have to leave. In the morning I played a game of outdoor tennis with a pro. In the afternoon we took a walk in the hotel garden. Our plane was scheduled for the early evening and the hotel is located just minutes from the airport, which meant that we could make the most of our last day. Next articleLet’s go out in Brussels!